In July of 2017, all three major Argentinian mobile operators purchased spectrum licenses in LTE Band 7, a mid-band frequency from 2500MHz to 2690MHz. Personal was the quickest network off the mark, with its first tower online by October, but according to millions of crowdsourced records from Tutela’s database, Movistar is the operator that has built out its spectrum the quickest -- and it’s already reaping the rewards. 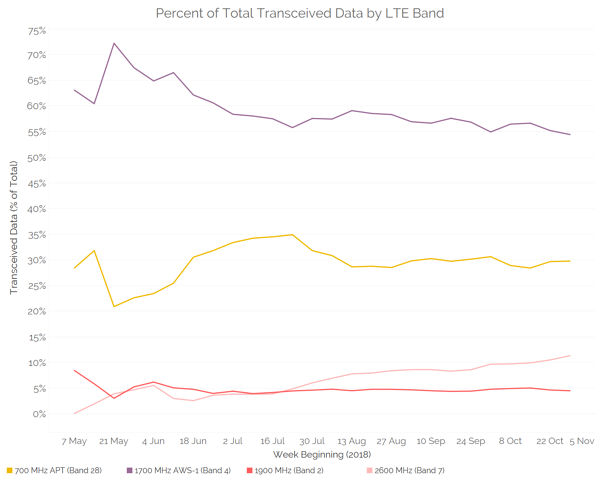 To evaluate the rollout of Band 7 in Argentina and see how it compares to other LTE bands, we collected over 7 million network quality records for devices using Band 7, and conducted over 640,000 download speed tests for customers on Movistar, Personal and Claro. We test mobile networks in a way that represents the day-to-day usage and experience of real-world mobile users, such as accessing websites or downloading and sending images (not the maximum potential speeds under test conditions), so we can see what a typical user is experiencing on any given network. 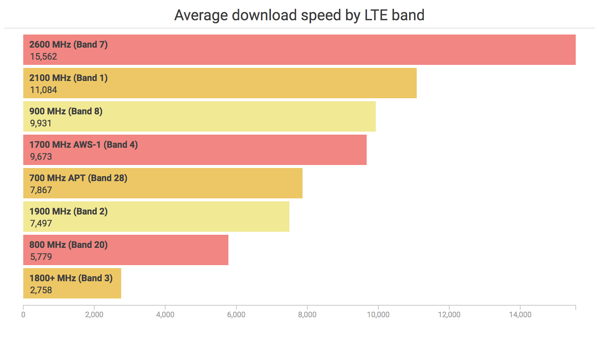 The data -- which includes over 26 million network quality records from the last 30 days alone -- shows that Movistar has leapfrogged Personal to have the fastest average download speed in the country, thanks largely to its new 2.5GHz network. Nationally, Movistar had an average download speed of 10.4 Mbps for the month of October, putting it in first place before Personal, which saw average speeds of nearly 10.2 Mbps. 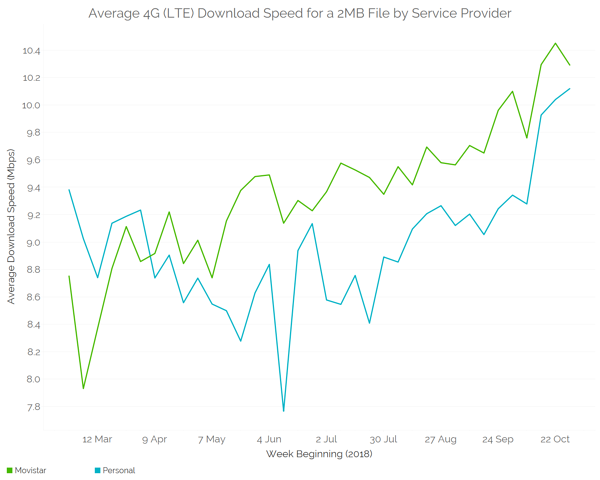 That marks a turnaround from our March report, which ranked Personal in first place with an average download speed of 9.44 Mbps, and Movistar lagging with an average of just 9.07Mbps. Both operators have been building out their 2.5GHz network, which accounts for the across-the-board improvement in speeds; Movistar, however, has deployed 2.5GHz on double the number of cell towers than Personal, which explains why its network has seen a greater improvement. Why has the 2.5GHz deployment had such a significant effect on Movistar’s network in such a short time? 2.5GHz is the highest frequency that any operator has deployed for LTE in Argentina, and high-band spectrum is capable of faster speeds than lower-band spectrum. This is visible in the data: in Buenos Aires, where the vast majority of 2.5GHz cell towers are located so far, data transfers on Band 7 are much faster than on other bands. Part of that will be due to the lower congestion on Band 7 -- since not all smartphones support Band 7 yet -- but also due to its higher capacity. However, there is a tradeoff: thanks to its higher frequency, 2.5GHz travels shorter distances and penetrates buildings worse than lower-band spectrum. Thanks to those characteristics, both Movistar and Personal have focused on deploying Band 7 in high-density urban environments, primarily Buenos Aires. Looking at the national results with Band 7 removed emphasizes the effect that it’s had on improving Movistar’s performance. With Band 7 removed, Movistar’s average download speed is back down to just 9.24 Mbps, nearly identical to its result in March. Personal’s average speed also drops, but by less, demonstrating the comparatively small role that 2.5GHz is playing for Personal compared to Movistar. When looking at spectrum utilization nationwide for all networks, it's clear that the 2.5GHz deployment is having a small (but increasing!) influence. As the share of data transcieved over 2.5GHz has crept up, from below five percent in May to over 10 percent in October, there has been a drop in the share of data transcieved on the workhorse 1700MHz band, which was previously handling as much as 70 percent of all LTE data traffic. Although Claro participated in the spectrum auction and was awarded 30MHz of 2.5GHz spectrum, the company has yet to add any Band 7 towers to its network. 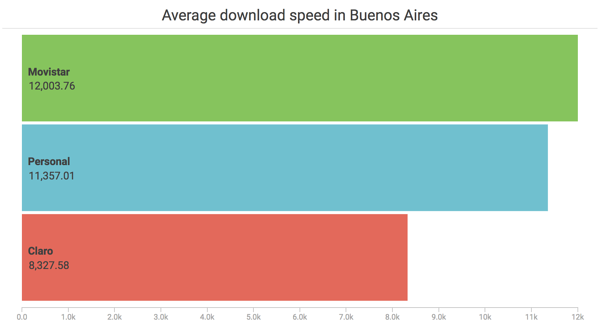 The effect can be seen in the average download speed, particularly in Buenos Aires: Claro customers experience an average download speed of just 8.3 Mbps, significantly behind that of Personal and Movistar. The reason is evident: in Buenos Aires, the majority of data on Claro's network travels over 700MHz and 1700MHz channels, which across all operators have a much lower average throughput (8-10 Mbps) than 2.5GHz (15Mbps). Although the difference between the networks may not be as pronounced just now, Claro's lack of mid-band spectrum like 2.5GHz will hinder the network as data volume continues to increase. Overall, while it’s clear that both Movistar and Personal have been impressively quick at building out their newly-acquired 2.5GHz spectrum, the speed and scale of Movistar’s deployment has resulted in a noticeable boost in download speeds for its customers in Buenos Aires, resulting in it taking the crown for fastest network nationwide. As more Band 7-compatible handsets come online and LTE-Advanced technologies such as carrier aggregation are rolled out, having coverage across multiple carriers in one location will be increasingly important for networks to manage congestion and provide the reliable download speeds that subscribers expect. Movistar has moved the quickest to take advantage of its new spectrum holdings, and the results should continue to tell. Discover more of our data insights for Argentina, and across the world, by joining Tutela Insights today.